Myelin-producing cells of the central nervous system, oligodendrocytes, facilitate normal neuronal function. While myelin acts as an insulator, it has additional roles crucial for axonal activity. Myelin disruption contributes to a growing list of neurological diseases, including the most common neurological disease in young adults, multiple sclerosis (MS)(Browne et al., 2014). Patients with extensive demyelination, such as in MS, exhibit severe motor deficits, as well as psychiatric symptoms, including a higher incidence of cognitive dysfunction (Feinstein et al., 2013). While psychiatric diseases are not typically associated with overt demyelination, subtle white matter abnormalities have been observed (Mighdoll et al., 2015), and it is proposed that mild myelin alterations reduce conduction velocity, which alters timing within neural circuits, including oscillations (Filley and Fields, 2016; Pajevic et al., 2014; Almeida and Lyons, 2017). Proteolipid protein (PLP1) is a major structural component of myelin (Griffiths et al., 1998) and mutations in the Plp1 gene are deleterious in humans. Plp1 point mutations or gene duplications lead to the dysmyelinating diseases, Pelizaeus-Merzbacher disease (PMD) and spastic paraplegia type 2 (Torii et al., 2014). Patients with mutations resulting in complete deletion of the PLP1 protein exhibit mild early impairments that progress to spastic quadriplegia, ataxia, and cognitive impairments in adolescence. Genetic deletion of PLP1 in mice does not impair myelination and induces subtle alterations in myelin structure that correlate with a slight reduction in spinal cord conduction velocity (Klugmann et al., 1997; Petit et al., 2014). However, by 16 months (16M) Plp1-null mice exhibit severe motor deficits, myelin loss and progressive axonal degeneration (Griffiths et al., 1998), indicating that PLP1 plays a role in myelin support of axonal integrity. This study evaluates early cellular alterations contributing to progressive pathology in Plp1-null mice. To observe region-specific cellular alterations, we used high throughput methods to generate unbiased regional analysis. These analyses revealed previously unidentified cellular responses to mild myelin disruption. We provide evidence that enhanced proliferation in the subventricular zone (SVZ) leads to a progressive accumulation of new oligodendrocytes in the corpus callosum (CC) and olfactory bulb (OB). Recent studies of different mouse models suggest that mild myelin deficits eventually lead to cognitive deficits (Poggi et al., 2016), but our studies are the first to demonstrate mild myelin disruption resulting in specific behavioral alterations in young adulthood. To quantify oligodendrocytes, we studied Plp1-eGFP mice that express eGFP under the PLP1 promoter (Mallon et al., 2002). Oligodendrocyte distribution appeared grossly normal in Plp1-eGFP + Plp1 null mice (Figure 1A,B). To provide high-volume analysis of oligodendrocytes, we optically cleared Plp1-eGFP tissue (Mallon et al., 2002), with a modified process by which eGFP was maintained in the cytoplasm of Plp1-eGFP+ cells (see Materials and methods) (Yang et al., 2014). Plp1-eGFP+ cell bodies and processes were visible in the cleared tissue (Figure 1C,D), and a comprehensive survey of changes in Plp1-eGFP+ cell number by cleared tissue digital scanned light-sheet microscopy (C-DSLM)(Ryan et al., 2017) suggested an increase in Plp1-eGFP+ oligodendrocytes in 6M Plp1-null OB and a significant increase in oligodendrocytes in the forebrain (Figure 1E, Table 1). To validate the increased oligodendrocyte density in the Plp1-null mouse, we developed a semi-automatic quantification method to compare oligodendrocyte density in specific brain areas (Figure 1—figure supplement 1). This analysis was performed on tiled confocal images of 30 μm sagittal tissue sections. At 6M, Plp1-eGFP+ oligodendrocyte density was increased in the rostral CC/genu and the OB of the Plp1-null brain, but not other regions (Figure 1E–H, Figure 1—figure supplement 2). The oligodendrocyte cell densities determined by C-DSLM vs confocal quantification were remarkably consistent (Figure 1E,F). Using the same quantification method, the oligodendrocyte density increase was confirmed with the pan oligodendrocyte marker, Olig2, and an increase in Olig2+cells was observed in the rostral CC prior to increased Plp1-eGFP+ cells (Figure 1I,J). A low-grade inflammatory response in the CC was demonstrated by increased GFAP immunoreactivity in 2M Plp1-null mice (Figure 1—figure supplement 3) (Petit et al., 2014). We tested the prediction that progenitor proliferation resulted in the increase in oligodendrocytes (Figure 2). The thymidine analog EDU was injected and 3 weeks later, the density of EDU + SOX10+ (Figure 2, Table 2) and EDU + Plp1-eGFP+ oligodendrocytes in the CC and OB (Figure 2D,E, Table 2) was increased in 4M Plp1-null mice. TUNEL staining of the tissue was unchanged, suggesting normal cell death (Figure 2—figure supplement 1). Thus, the increase in oligodendrocytes in Plp1-null mice resulted from increased proliferation. The newly produced oligodendrocytes differentiated into Gst-pi+ mature oligodendrocytes (Figure 2—figure supplement 2). In the adult brain, there are two sources of oligodendrocytes: local oligodendrocyte progenitor cells (OPCs) and progenitors in the germinal zone of the SVZ (Figure 2A) (Tepavčević et al., 2011). In 2M mice, neither PLP1 protein nor Plp1-eGFP were expressed in either NG2+ OPCs or Sox2+ SVZ cells (Figure 2—figure supplement 3). We used EDU to label local proliferation and determine whether local OPCs or SVZ cells had increased proliferation. We observed the number of EDU+ cells 2 hr (P18 and 2M) or 4 hr (4M) after injection to label 1 or 2 cell cycles, respectively. In the Plp1-null mice only the SVZ and RMS (Sox2+ EDU+ cells) had increased proliferation (Figure 2F,G). No local proliferation increase occurred in the OB, CC, M1, or HP (Figure 2H). In addition, the density of NG2+ OPCs was unaltered in 4M Plp1-null mice, and the percentage of NG2+ OPCs that expressed EDU 2 hr post injection was comparable for WT and Plp1-null mice (Figure 2I, Figure 2—figure supplement 4). SVZ progenitor cells normally give rise to migratory progenitors that travel within the RMS and differentiate into neurons and oligodendrocytes in the OB (Tepavčević et al., 2011). The density of EDU+ neurons (NeuN+) and the percentage of NeuN+ cells that were EDU+ 3 weeks after EDU injection, were not altered in 4M Plp1-null mice (Figure 2—figure supplement 5). On the other hand, the number of EDU+ oligodendrocytes (SOX10+and Plp1-eGFP+) had increased (Table 2). These data suggest no gross alteration in neurogenesis in Plp1-null mice. However, Pax6+ cells were significantly reduced in the main and accessory olfactory bulb, indicating a specific loss of Pax6+ neurons (Figure 2—figure supplement 6). In addition, the Pax6+ cells expressing Sox2, a marker of progenitors was reduced, indicating a reduction in neural progenitors in the RMS (Figure 2—figure supplement 6). Therefore, the increase in oligodendrocytes occurs at the expense of the production of Pax6+ neurons. The SVZ generates oligodendrocytes that contribute to remyelination (Tepavčević et al., 2011). 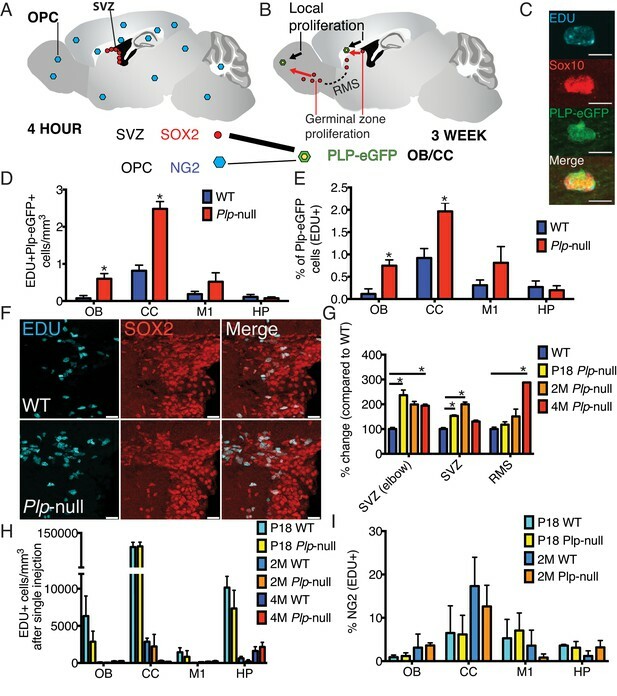 We hypothesize that SVZ activation in Plp1-null mice is initiated through signals related to myelin disruption and axonal impairment. Optic nerve axons develop spheroids as early as 2M (Griffiths et al., 1998). Therefore, we expected to see axonal disruption prior to SVZ activation and the increase in oligodendrocytes. Thy1-YFP transgene was crossed into the Plp1-null mouse and YFP+ spheroids were found in axons of projection neurons at 4M (Figure 3A,B,C). No loss of layer V Thy1-YFP+ neurons was observed (Figure 3G). SMI-32+ spheroids were already visible at 2M in Plp1-null mice (Figure 3E). Interestingly, in P18 axons, both WT and Plp1-null exhibited a wavy phenotype, but no spheroids greater than 10 μm (YFP or SMI-32+) were observed (Figure 3A). Thus, SVZ activation and increase in Plp1-null oligodendrocytes occurred before observable accumulation of pathologic spheroids. Changes in oligodendrogenesis and axonal disruption may lead to changes in axonal conduction velocity (CV). We performed measurements of CV in the CC of WT and Plp1-null mice. Figure 4 shows that the fast transmission N1 peak of the compound action potential (CAP) elicited by electrical stimulation of the CC is absent in 2M and 6M Plp1-null mice, but not in P18 Plp1-null mice. In addition, the latency to the slower N2 peak is longer (N1 and N2 peaks of the CAP were defined as in Crawford et al. (2009). These data indicate that although the conduction velocity is initially normal, it is eventually slower in the Plp1-null mouse, which is relevant for interhemispheric coordination of neural activity, and is likely to alter behaviors such as motor coordination. Adult Plp1-null mice are behaviorally grossly normal (Klugmann et al., 1997). However, the local increase in oligodendrocytes in OB and CC starting at day 18 and subsequent changes in axonal swelling and CV at 2M suggest that circuit function and behavior are altered in Plp1-null mice 2M or older. We tested WT and Plp1-null mice with a battery of behaviors to determine whether a select subset are altered. We focused on testing motor coordination, problem solving and sensory processing because these behaviors are known to be altered at early stages in demyelinating disorders (Amboni et al., 2013; Ruan et al., 2012). Young adult Plp1-null mice did not display deficits on the rotarod, a classic test of gross motor function (Figure 5A), consistent with previous studies (Griffiths et al., 1998). To examine finer motor coordination, we analyzed the gait and swimming patterns. Plp1-null mice did not differ in gait from WT at 18 days of age. We performed gait measurements on four 18-day-old mice, two Plp1-null males and two wild-type males. The mean stride length for Plp1-null animals was 4 cm with a standard deviation of 0.15 cm. Mean stride length for wild-type animals was 3.92 cm with a standard deviation of 0.3 cm. Front-hind paw offset for Plp1-null animals was 0.2 cm with a standard deviation of 0.08 cm. Wild-type animals front-hind paw offset was 0.21 cm with a standard deviation of 0.2 cm. These values were not significantly different (Wilcoxon rank-sum p=0.67 for stride length and p=0.78 for paw offset). However, 3M- and 9M-old Plp1-null mice overstepped forelimbs with respect to hindlimbs and displayed longer stride length (Figure 5B–D). We then tested coordinated swimming (Brooks and Dunnett, 2009). Swim distance was significantly reduced in 9M Plp1-null mice (Figure 5F) and mean velocity was reduced in 3M and 9M Plp1-null mice (Figure 5G, Figure 5—videos 1 and 2). We used a coding scheme to evaluate swimming pattern (score of 0 to 3, see Materials and methods). 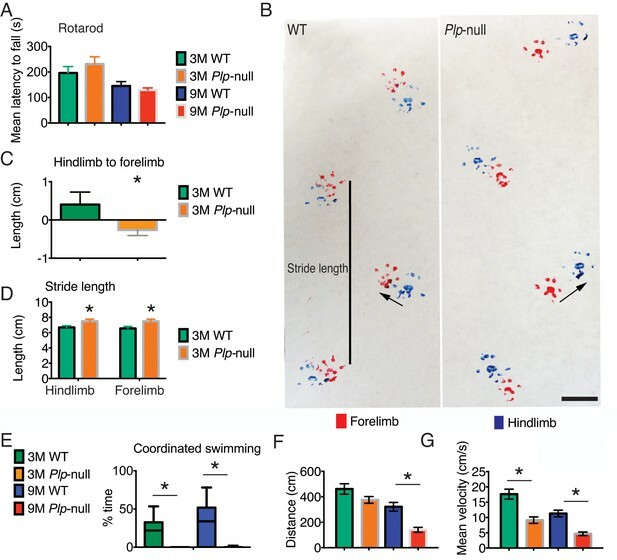 Plp1-null mice never had a coordinated swimming pattern, that is, the highest score (Mighdoll et al., 2015) was never observed in 3M or 9M Plp1-null mice (Figure 5E, Figure 5—figure supplement 1). The altered gait pattern and lack of coordinated swimming indicate a deficit in motor coordination in young Plp1-null mice preceding gross motor deficits at 16M (Griffiths et al., 1998). The deficits in motor coordination suggest a disruption of the integration of proprioceptive cues necessary to produce a coordinated motor pattern. These subtle motor deficits did not interfere with general locomotion in other behavioral assessments (Table 3). Gait and cognition are highly related in humans, and deficits in gait precede declines in cognitive function in neurological disease (Amboni et al., 2013). We hypothesized that these mice could have a broader deficit in information processing leading to cognitive deficits. In order to evaluate cognition/executive function, we tested Plp1-null mice in the Puzzle Box, a comprehensive test of learning, memory and problem-solving (Ben Abdallah et al., 2011). In the Puzzle Box, mice must reach a dark goal box to escape a brightly lit arena, and access to the goal box is made progressively more difficult (Figure 6A). The time of entry to the dark goal box in each stage of this task depends on problem solving of novel entry constraints within each stage using skills learned in previous stages. Progressive difficulty is reflected by longer time to enter in the latter stages (Figure 6B,C). Plp1-null mice (3M and 9M) took longer to enter in stage three when the entry-way was filled with saw dust (Figure 6B,C), and 9M-old Plp1-null mice took longer to enter in the fourth stage when the entry was covered (Figure 6C). No alteration in the digging behavior necessary to dig through the underpass filled with sawdust was noted (Figure 6—figure supplement 1A,B). Thus, cognitive impairments were more noticeable after increasing task difficulty. To assess differences in working memory we used the Y maze where differences result in changes in alternation of entry to a novel arm. 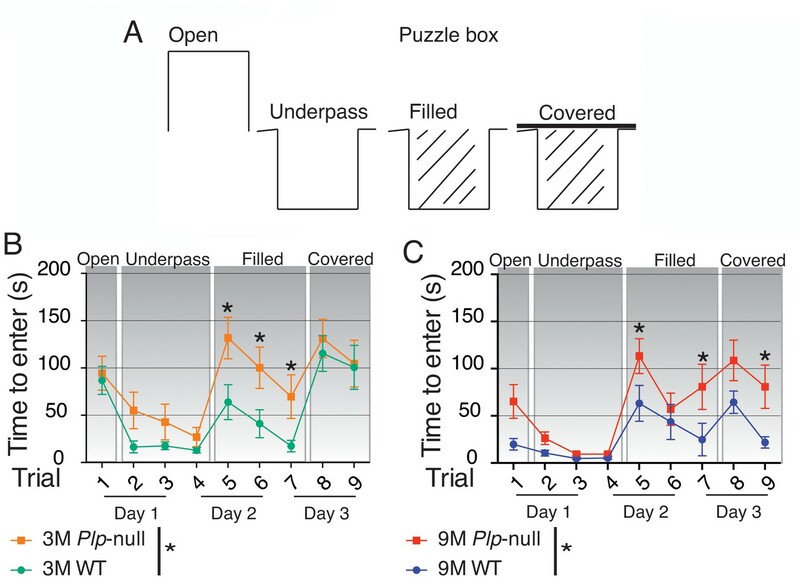 We observed no deficit in spatial working memory in this behavioral task, as 4M and 9M Plp1-null mice performed similarly to WT in the Y maze (Figure 6—figure supplement 2, Table 4). The Plp1-null mice were tested in the marble burying task, which is used to measure repetitive perseverative behavior (Thomas et al., 2009). Mice normally exhibit burying behavior defined as displacement of bedding material using the snout and forepaws to cover an object. Plp1-null mice displayed a striking behavioral deficit in this task at 3 and 9M (Figure 6—figure supplement 3). The marble burying deficit could result from impaired motor coordination necessary to dig. However, digging was not altered in the puzzle box (Figure 6—figure supplement 1A,B) and was not significantly reduced in the marble burying task in 3M Plp1-null mice (Figure 6—figure supplement 3C), suggesting that the perseverative burying deficit occurred prior to the reduced digging behavior. On the other hand, the amount of time spent digging was significantly reduced in 9-month-old Plp1-null mice, demonstrating a progressive deficit in burying is associated with a decreased tendency to dig, possibly due to progressive motor impairment (Figure 6—figure supplement 3C). The tests of anxiety-like behavior were somewhat inconsistent: increased time in open arms of the zero maze in 3M mice indicated reduced anxiety-like behavior; however, 9M Plp1-null mice exhibited increased anxiety-like behavior in the open field (Table 5), and, although this was not a statistically significant effect, Plp1-null mice exhibited an increased latency to explore the puzzle box entry (Figure 6—figure supplement 1C,D). Paradoxical results in the evaluation of anxiety-like behavior have been previously observed in mice overexpressing PLP1, indicating myelin impairments could disrupt emotional regulation (Tanaka et al., 2009; Edgar and Sibille, 2012). There is a remarkable link between olfaction and neurological disorders (Ruan et al., 2012). We assessed olfactory function through the go-no-go task where a thirsty mouse licks for a water reward in response to a rewarded odor (Li et al., 2015). Plp1-null mice were able to distinguish between the odorants (Figure 7A), and when they were retested 5 months later (at 8M) they performed as well as at 3M (Figure 7A), supporting the conclusion that associative learning of easily differentiated stimuli was normal. We then evaluated odor investigation using the habituation/dishabituation paradigm (Yang and Crawley, 2009). The mice investigated synthetic odors less than social odors (Figure 7B,C). The investigation of synthetic odors was significantly reduced in 9M Plp1-null mice compared to WT (Figure 7B). 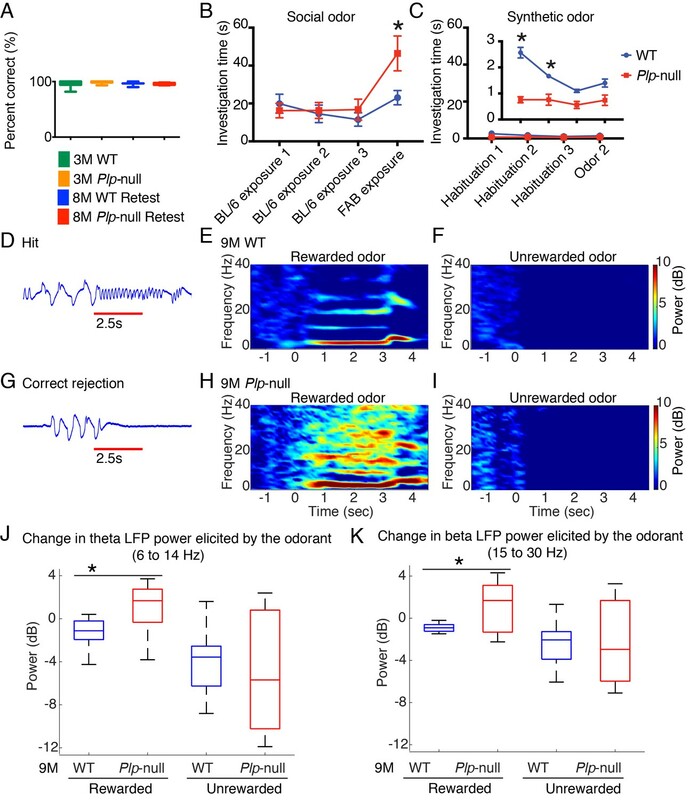 By contrast, novel social odors resulted in a higher dishabituation rebound in Plp1-null mice (Figure 7C), which suggests the salience of the novel social odor was higher in Plp1-null mice. 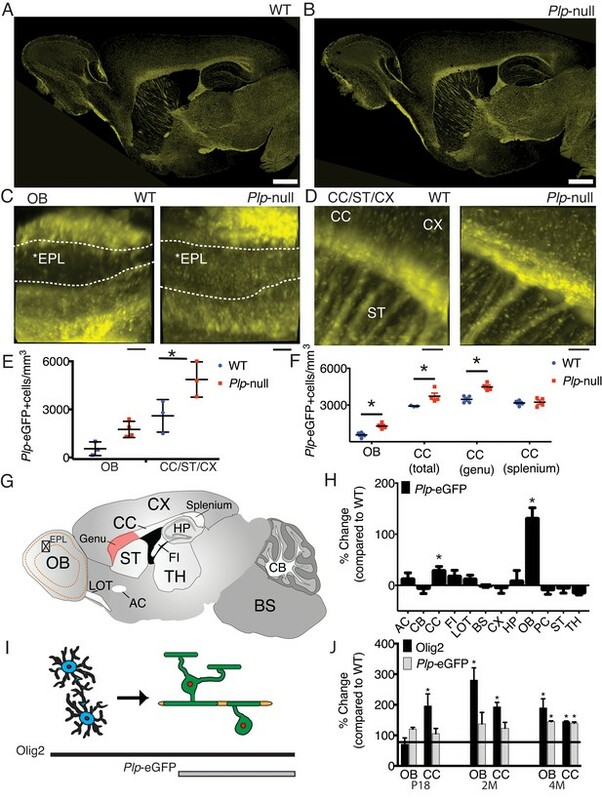 OB output is carried by myelinated axons that converge to form the lateral olfactory tract; therefore, myelination is important for information transmission from OB to piriform cortex. Mild myelin alterations reduce conduction velocity, which will alter oscillations (Filley and Fields, 2016; Pajevic et al., 2014; Almeida and Lyons, 2017). Computational modeling of piriform cortex LFP oscillations indicated that a decrease in conduction velocity would lead to an increase in oscillatory power (Figure 7—figure supplement 1), and indeed, awake behaving recordings demonstrated altered oscillations in Plp1-null piriform cortex (Figure 7D–K). These mice had increased basal power of oscillation and odorant-induced changes in power within the theta and beta bands in rewarded trials (Figure 7E,F,H,I,J,K, Figure 7—figure supplement 2). These are the first studies to demonstrate that mild myelin disruption results in enhanced proliferation in the SVZ generating new oligodendrocytes, accompanied by specific behavioral alterations and changes in neural oscillations in young adulthood (Figure 8). We characterize the early cellular response to the absence of the important myelin protein, PLP1. PLP1 is not required for myelination (Klugmann et al., 1997). However, PLP1 is necessary for oligodendrocyte-mediated support of axonal integrity, and Plp1-null mice develop progressive axonal pathology (Griffiths et al., 1998). We demonstrate that these early cellular alterations occur prior to axonal swellings, a late sign of axonal disruption. SVZ progenitor cells are the likely source of the new oligodendrocytes in the CC and OB, given the early increase in EDU+ cells in the SVZ and the proximity of the SVZ to these regions (Figure 2). Unexpectedly, local OPCs did not contribute to the increase in oligodendrocytes in Plp1-null mice, as local OPC numbers or proliferative rate did not change (Figure 2, Table 2). The cellular response is not a response to oligodendrocyte death and appears earlier than measurable signs of axonal disruption, e.g. swellings and reduced conduction velocity. One hypothesis is that the absence of PLP1 during embryonic development alters the proliferative capacity and fate of SVZ cells into adulthood. Alternatively, axonal alterations and their downstream response, which are not observable through these methods, could signal for the enhanced proliferation. This hypothesis seems more likely as increased oligodendrogenesis occurs throughout early adulthood and it is likely these signals persist and perpetuate oligodendrogenesis. Finally, we observed region-specific reactive gliosis in the white matter of the 2M old Plp1-null mouse (Figure 1—figure supplement 3). Whether the reactive gliosis is caused by Plp1 depletion, or is a reaction to axonal disruption is not known. Interestingly, reactive gliosis is found in the CC of animals treated with cuprizone where it is thought to be mediated by Toll-like receptors (Esser et al., 2017). Mild myelin abnormalities are thought to be a primary cause of behavioral alteration (Poggi et al., 2016) and are likely involved in mild cognitive impairment in neurodegenerative disorders (Bartzokis, 2011). Mice lacking Plp1 gene expression displayed decreased conduction velocity in the CC at 2M (Figure 4) and specific behavioral alterations by 3M (Figures 5 and 6), indicative of a greater early impact of myelin dysfunction than previously documented (Griffiths et al., 1998; Petit et al., 2014). 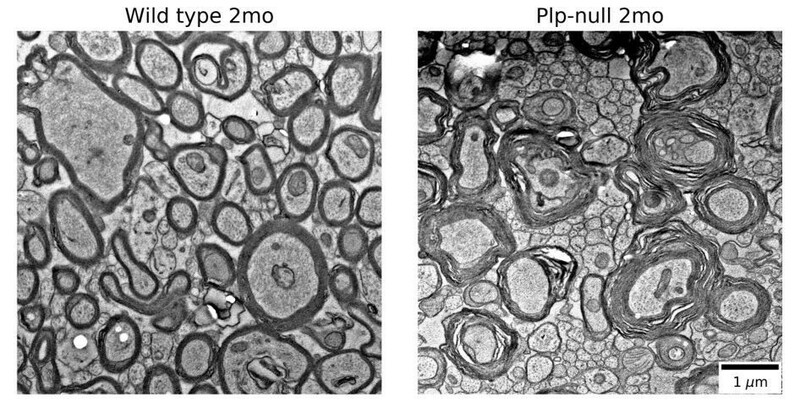 Plp1-null mice are remarkably normal given the extent of cellular alterations, including an impressive amount of axonal disruption at 2M (Figure 3). While Plp1-null mice appear grossly normal, and learning and memory are relatively unaltered, cognitive impairments requiring higher-order processing (Figure 6) were observed, which became increasingly apparent with task difficulty in the Puzzle Box (Figure 6). Overall, the behavioral profile of Plp1-null mice indicates that higher order processing is disrupted, supporting the hypothesis that myelin alterations impair timing within neuronal circuits, leading to a deficit in information integration. The lack of major consequences of the loss of PLP1, a protein that constitutes 20–30% of myelin protein (Morell et al., 1972), is surprising. Myelin disruption and associated axonal pathology lead to conduction velocity delays (Petit et al., 2014) (Figure 4). It is hypothesized that myelin disruption will lead to alterations in timing of action potential transmission resulting in altered neural oscillations (Pajevic et al., 2014). Oscillations are important for transmission of information in neural systems because they provide a syntactical framework for packaging information (Buzsáki and Watson, 2012). Here, we find that the myelin/axonal pathology is accompanied by increases in the power of oscillations in the theta and beta frequency (Figure 7 and Figure 7—figure supplement 1). Similar increases in the power of oscillations are observed in MS patients (Zhou et al., 2014). Interestingly, optogenetic activation in the beta frequency promotes oligodendrogenesis and adaptive myelination accompanied by behavioral motor improvement (Gibson et al., 2014), and recent studies show that optogenetic activation of gamma oscillations attenuates amyloid load in an animal model of Alzheimer’s disease (Iaccarino et al., 2016), a pathology accompanied by defects in myelination (Bartzokis, 2011). We propose that SVZ production of new oligodendrocytes and the accompanying increase in oscillatory power is a protective response reducing behavioral effects of the absence of PLP1 in myelin (Figure 8). How a protective increase in oscillatory power is generated is an open question in disorders such as early MS and Alzheimer’s. Future studies of compensatory changes in circuit oscillations and SVZ production could yield translationally relevant results for the treatment of progressive behavioral impairment in these disorders. All animals used in this study were treated in accordance with the University of Colorado Animal Care and Use Committee guidelines. We used Plp1-eGFP mice that express eGFP under the PLP1 promoter (Mallon et al., 2002), Plp1-null mice (B6;129-Plp1tm1Kan/J, Jackson Laboratory Stock No: 003255, RRID:IMSR_JAX:003255) (Griffiths et al., 1998) and crosses of these two strains. Because the PLP1 gene is found in the X chromosome Plp1-null heterozygous females were crossed with wild type (WT) C57BL/6 males (Jackson Laboratories 000664) yielding Plp1-null and WT males that were used in all experiments. To study axonal disruption we crossed Plp1-null mice with Thy-1-YFP mice (B6.Cg-Tg(Thy1-YFP)HJrs/J, Jackson Laboratory Stock No 003782, RRID:IMSR_JAX:003782). For all experiments, animals were kept on a reversed light/dark cycle of 14:10 hr with lights on at 10:00 PM. Food (Teklad Global Rodent Diet no 2918; Harlan, Denver, CO) was available ad libitum. All behavior experiments were performed during the dark cycle between the hours of 11 am and 5 pm. All mice were bred in the animal facilities of the University of Colorado Anschutz Medical Campus. Following weaning at 4 weeks, Plp1-null male mice and WT male siblings were group housed to prevent any impact of social isolation (Klugmann et al., 1997). Whenever possible, behavioral experiments at different ages were performed with the same cohort of animals. Plp1-eGFP mice were used to develop the clearing protocol and measurement techniques (Mallon et al., 2002). PACT was performed according to the protocols outlined by the Gradinaru group (Yang et al., 2014). Plp1-eGFP mice were perfused with 4% paraformaldehyde diluted from 32% paraformaldehyde (Electron Microscopy Sciences, Hatfield, PA, #14714) with 0.1M Phosphate buffered saline (PBS). Brain sections were incubated overnight in 4% acrylamide (Sigma-Aldrich, #A9099) with 0.25% photo-initiator (VA-044, Wako Chemicals USA Inc, Richmond, VA) in 0.1M PBS in 5 mL conical tubes at 4°C. The samples were degassed using a homemade chamber to remove nitrogen and rotated at 37°C for 2 hr. We find that complete degassing is a critical step for sample clarity and antibody labeling. After excess hydrogel was removed by washing three times in 0.1M PBS, tissue sections were placed in 8% SDS in 0.1M PBS in 5-ml conical tubes and rotated at 37°C for multiple days (timing dependent on size and type of tissue) and directly mounted in index matching solution (RIMS), consisting of 40 g of Histodenz (Sigma-Aldrich, #D2158) dissolved in 30 ml of 0.01 M PBS (final concentration of 88% Histodenz w/v). Samples were incubated in RIMS until the brain became transparent. Cleared brain samples were imaged using cleared tissue digital scanned light-sheet microscopy (C-DSLM), a technique that corrects automatically for spatially heterogeneous refractive index to generate in-focus images of cleared tissue (Ryan et al., 2017). Mice were anaesthetized with avertin or fatal plus before transcardial perfusion. Mice were first perfused with 10 ml of 0.1 M PBS (pH 7.4) followed by 25 ml of 4% paraformaldehyde (PFA) in PBS (pH 7.4) with a flow rate of 12 ml/min. Brains with olfactory bulbs attached were dissected out and post-fixed overnight in PFA at 4°C. They were then incubated in cryoprotectant (20% glycerol in 0.1 M Sorensen’s buffer, pH 7.6) for 48 hr at 4°C. Free-floating sagittal 30 μm sections were prepared on a cryostat and placed in PBS. For long-term storage, sections were placed in cryostorage solution (30% w/v sucrose, 30% v/v ethylene glycol, 1% polyvinyl-pyrrolidone (PVP-40) in 0.1 M Sorensen’s buffer, pH 7.6). For labeling newly generated oligodendrocytes, mice were given i.p. injections of EDU (25 mg/kg) once a day for 3 days and sacrificed 3 weeks after the final injection. For labeling of cells generated within 1–2 cell cycles, mice were sacrificed 2 (P18 and 2 Month mice) or 4 hr (4 Month mice) after a single i.p. injection of EDU (25 mg/kg) was given. EDU click-it kit was used to visualize EDU labeling and was performed according to manufacturer’s directions (ThermoFisher, #C10340). EDU+ and SOX2+ cells in the SVZ and RMS were counted by applying surfaces that delineated the cells based on the intensity of the immunostaining with IMARIS (Bitplane, RRID:SCR_007370). EDU+ cells in other regions were quantified using the MATLAB algorithm on tiled sagittal sections. Sections were washed 3x in PBS for 5 min. For Olig2, Sox10, and Sox2, antigen retrieval was performed by microwaving sections in a Pelco Biowave microwave oven 1 × 5 min at 550W in sodium citrate buffer pH 6, followed by washing 1x in PBS for 5 min. They were then blocked for 1–2 hr in blocking solution (5% normal donkey serum, 0.3% Triton-X in PBS). For EDU visualization the EDU click it kit (ThermoFisher #C10340) was performed following blocking step. Sections were incubated in primary antibody diluted in blocking solution overnight at room temperature. Primary antibodies used: goat anti-Sox10 (1:500, Santa Cruz, sc-17342, RRID:AB_2195374), goat anti-Sox2 (1:1000, Santa Cruz, sc-17320, RRID:AB_2286684), Rabbit anti-Olig2 (1:10,000, gift from Dr. Charles Stiles, Harvard University), guinea pig anti-NG2 (1:1000, gift from Dr. William Stallcup, Burnham Institute for Medical Research), mouse anti-NeuN (1:1000, Milipore, MAB377, RRID:AB_2298772), rabbit anti-Pax6 (1:500, Abcam, ab5790, RRID:AB_305110), rat anti-PLP1 (clone AA3)(Yamamura et al., 1991). The sections were washed 3x in PBS, followed by a 2-hr incubation in secondary antibody diluted in blocking solution at room temperature. Species-specific donkey secondary antibodies conjugated to Alexa fluorophore 488, 568 or 647 (1:1000, Molecular Probes) were used. The sections were washed 1 × 5 min in PBS followed by a 1 × 5 min in water. They were mounted on charged slides, coverslipped in Fluoromount G, and sealed with clear nail polish. For each antibody, a no primary control was used to verify the specificity of the secondary antibody. Apoptotic cells were labeled using a TUNEL (TdT-mediated dUTP-X nick end labeling) kit (Sigma #12156792910). The TUNEL kit labels DNA fragments with an antibody conjugated to bromodeoxyuridine. Immunohistochemistry was performed as described above to identify the identity of TUNEL+ cells that were undergoing apoptosis. To quantify Plp1-eGFP and Olig2+ cells in tiled sagittal sections, tiled z-stacks with a thickness of 10 μm and a step size of 3 μm were taken on a Leica SP5 confocal microscope using a 25x water-immersion objective. Three tiled sections were analyzed per mouse with at least three mice/genotype. The scale of the images is 0.8 μm/pixel. The acquired z-stack was rendered 2D through a maximum intensity projection using the Leica software. Images were analyzed using a MATLAB (RRID:SCR_001622) script run by a user who was blind to the genotype during the entire analysis (Gould, 2018). First, background subtraction was performed to render the background more homogenous. For Plp1-eGFP+ cells, the background detection eliminated signal from the Plp1-eGFP+ oligodendrocyte processes and allowed for better detection of the signal from the cell bodies. To perform background subtraction the function imopen was used to erode then dilate the image with a disk size determined by the blinded user (average disk size: WT = 8.72 ± 3.61 pixels; Plp1-null = 5.26 ± 0.88 pixels). Next, positive pixels were determined using a user-defined threshold value. The threshold value was determined by observing the overlap of the thresholded image and the original image. The average threshold value was 0.14 (±0.02) for WT and 0.15 (±0.03) for Plp1-null (in an intensity scale of 0 to 1). Connected objects were identified within the positive pixels using the function bwconncomp. Small objects (<5 pixels) were removed from the analysis since they are too small to be a cell. The percentage of large connected objects over 50 pixels was 2.9% (±1.5) for WT and 0.5% (±0.7) for Plp1-null. Therefore, connected objects containing multiple cells comprised only a small percentage of the cells identified. To split the connected objects containing multiple cells, erosion was performed using the function imerode with a disk size of 1 pixel. The erosion splits the connected object into smaller objects that reflect the number of cells within the larger connected object. These smaller objects do not cover the entire cell body; however, the smaller objects created do not have an impact on the overall cell size determined since they comprise a small percentage of the objects quantified. Data was collected in a structural array and exported as a. csv file. To determine the validity this MATLAB algorithm cell counts in a representative area (200 pixels2) from each region examined were manually quantified and then quantified using the MATLAB algorithm. The average percent difference of MATLAB counts relative to manual counts was 4.9% (±4.4%) for WT and 6.4% (±2.5%) for Plp1-null. To visualize cleared Plp1-eGFP tissue sections, z-stacks were acquired on a homebuilt light-sheet fluorescence microscope (Ryan et al., 2017). The light-sheet was generated using a 4x NA 0.14 objective and the Rayleigh length was adjusted using a pinhole to match the sample size. Both 4x NA 0.14 and 10x NA 0.28 air immersion detection objectives were utilized for detection. The axial spacing for each objective was 3.5 μm for the 4x and 1 μm for the 10x objective. This yielded voxel sizes of 1.625 × 1.625 × 3.5 μm for the 4x objective and 0.65 × 0.65 × 1.0 μm for the 10x objective. The laser power was linearly increased through the entire stack through user-defined settings to account for a loss in signal-to-noise as imaging depth increased. At each image plane, an image was captured using both a uniform excitation pattern and sinusoidal excitation pattern with a user defined frequency. These images were used for HiLo image reconstruction to remove effects due to incomplete clearing and scattering (Mertz and Kim, 2010). HiLo processed image stacks were then processed such that the mean and standard deviation of each image plane were equalized (Phair et al., 2004). Intensity normalized HiLo processed image stacks were then filtered using multiscale adaptive image enhancement (Zhou et al., 2015). Plp1-eGFP cells were quantified in the final processed image stacks using both the above custom MATLAB code and Vaa3D cell-counting plugin (Peng et al., 2014). For MATLAB processing, light-sheet stacks are maximum z projected to match the size of the physical sections. Data are represented as mean ±standard error of the mean. For all immunohistochemical studies, an average per mouse was calculated from each set of representative images and at least three mice/genotype were analyzed. Statistical analysis with greater than two comparisons was performed using two-way ANOVA with Sidak’s multiple comparison test using Prism statistical software (Graphpad). Animals were anesthetized with 3% isoflurane in an O2-enriched chamber. Mice were transcardially perfused with ice-cold (2–5°C) oxygenated (95% O2/5% CO2) artificial cerebral spinal fluid (aCSF) for 2 min prior to decapitation. The brains were then extracted and placed in the same aCSF (in mmol/L: 126 NaCl, 2.5 KCl, 25 NaHCO3, 1.3 NaH2PO4, 2.5 CaCl2, 1.2 MgCl2 and 12 glucose)(Orfila et al., 2014). Coronal slices (400 μm thick) were cut with a Vibratome 1200 (Leica) and transferred to a holding chamber containing aCSF at room temperature for at least 1 hr before recording. Slices corresponding approximately to Plates 28–44 in the Franklin and Paxinos atlas (Paxinos and Franklin, 2012) were used for recording. CC conduction velocity was established by changing the distance between stimulating and recording electrodes from 0.5 mm to 2.0 mm, while holding the stimulus intensity constant (Crawford et al., 2009). The recording electrode was placed 1 to 1.5 mm away from midline and the stimulating electrode was initially placed 2.0 mm from the recording electrode in the contralateral hemisphere. The stimulating electrode was then moved toward the recording electrode to the closest distance of 0.5 mm in 0.5 mm steps. For analysis of the compound action potential (CAP), the peak latency for N1, where observed, and N2 were measured with four successive data acquisition sweeps per distance and the average of the four sweeps was recorded as the latency for that distance. Linear regression was then performed for each component to yield a slope that is the inverse of the velocity and the slopes were analyzed for statistical comparison using GraphPad. The amplitude of the N2 component was determined at increasing current steps from 0 to 4.0 mA in 0.25 mA increments. The maximum amplitude of the negative peak was measured in comparison to the preceding positive peak. The CAP amplitude was then graphed versus the stimulus level. Rotarod is a standard test of gross motor function (Brooks and Dunnett, 2009). Three trials were performed with a 10-min rest period between each trial. The acceleration program went from 3 to 30 rpm over the course of 5 min. The latency to fall was recorded. Mice were placed in a transparent tank (55cmx33cmx20cm) with the water level at approximately four inches and the mouse was unable to touch the bottom of the tank. Tap water was maintained at 70oF. Mice were not previously exposed to water as this also impacts performance. Mice were recorded from above to assess velocity and distance traveled. To assess swimming pattern the mouse was also recorded using an iPhone 5 positioned at the side of the tank. Mice swam freely for 30 s. A coding scale was used to evaluate the swimming proficiency: 0-floating, 1-forelimbs active, hindlimbs trailing, 2-all four limbs active, 3-tucked forelimbs, hindlimbs engaged. Gait analysis was performed by labeling the footpads with non-toxic tempera paint (Brooks and Dunnett, 2009). Footpads were painted with non-toxic tempra paint. Hindlimbs were painted blue and forelimbs were red. The gait pattern was evaluated as the mouse walked down a closed runway. Four to five representative strides were evaluated for each animal using ImageJ to quantify distances. The open-field task examines aspects of anxiety-like behavior (Prut and Belzung, 2003). Mice freely explored an open box (44cmx44cmx24cm) while being tracked from above for a 10 min trial. Prior to starting the trial the center and perimeter were delineated using the animal tracking software (Ethovision XT by Noldus). The software was used to determine the amount of time spent in the center versus periphery, as well as the distance travelled. The zero maze is a circular runway (diameter = 52 cm) with open and closed portions (Shepherd et al., 1994). Mice were tracked for a 10 min trial from above using the animal tracking software (Ethovision XT by Noldus). Prior to starting the trial the open arms and closed arms were delineated by the observer. The software was used to determine the amount of time spent the open and closed arms. The Y maze has three arms (37 × 7 × 20 cm) shaped like a Y (120° angle). The number of arm entries and which arm was entered was manually recorded while the mouse performed the task. The percent of successful alteration patterns (novel arm to novel arm) was determined (Hughes, 2004). We followed the procedure of Thomas et al., 2009. The number of marbles buried in a 10 min trial was assessed by a blinded observer. The marbles were laid out in a grid of 3 × 3 on top of bedding ~2 inches deep in a small open-field box (28 × 28 × 24 cm). The Puzzle Box was performed as previously described (Ben Abdallah et al., 2011). In brief, mice were given 3 min to enter a goal box (15cmx28cmx28cm). If the mouse did not enter the goal box it was encouraged and directed by the experimenter. The covered goal box was adjacent to a well-lit uncovered arena (58cmx28cmx28). The entry of the goal box began as a doorway (Browne et al., 2014) then was changed to an underpass (trial 2, 3, 4), the underpass was then filled with sawdust (trial 5, 6, 7), and then the filled underpass was covered with a small rectangular piece of cardboard (trial 8, 9). Each mouse underwent nine trials over a period of 3 days. The first day consisted of trials 1–3, the second day consisted of trials 4–6, and trials 7–9 occurred on the third day. Odorant-driven active associative learning was used to assess gross odor discrimination (Li et al., 2015). Access to water was restricted during the behavioral session; however, if mice failed to receive ~1 ml of water during the behavioral session, additional water was provided in a dish in the bottom of the cage. All mice were weighed daily and maintained at >80% of pre-water restriction weight. No mice dropped below >80% pre-water restriction weight during this study. Mice were trained in an olfactometer chamber to lick in response to the rewarded (S+) odor or refrain from licking in response to the unrewarded (S-) odor, using a go-no-go paradigm (Li et al., 2015). For this task, water-deprived mice initiate the trial by placing their head in a sampling chamber for a preafferent period (Li et al., 2015). 1–1.5 s after the trial is initiated the odor is delivered. The mouse obtains water-delivery to the rewarded odor when they lick at least once in four 0.5 s segments 0.5–2.5 s after odor onset. There is no penalty for licking prior to odor delivery. The mouse refrains from licking in response to the unrewarded odor due to the substantial effort required for licking the tube. During training mice were presented with 200 trials (block = 20 trials with 10 S + and 10 s− pseudo-randomly selected presentations) and the percent correct for each block was determined. Following completion of criterion (three consecutive blocks ≥ 85%) for two consecutive presentations, training was complete. All mice were trained on a rewarded odor (10% isoamyl acetate (v/v)) vs. unrewarded odor (mineral oil). Mice were then tested on a pair aldehydes (unrewarded: 1% (v/v) heptaldehyde; rewarded: 1% (v/v) heptaldehydes [50%] plus octaldehyde [50%]) at 3 months of age and tested again at 8 months of age with the same odor pairs. The percent correct responses were calculated for the last three trials. Synthetic odors were delivered by lightly soaking a piece of filter paper with the odorant. The filter paper was placed inside a cap with two punched holes, to ensure the odor could be detected. The habituated odor was isoamyl acetate (50 μM) and the novel synthetic odor was cineol (50 μM). For social odors, we rubbed the petri dish on the urogenital region of a female BL/6 or FAB background mouse. The mouse was habituated to the petri dish with an unscented piece of filter paper in it prior to the first trial for a period of 10 min. Habituation to repeated exposure of the same odor was performed by exposing the mouse to 3 2 min trials. On the fourth – 2 min trial, a novel odor was delivered. Simulations were performed in a computational model of the piriform cortex developed on the GENESIS simulator by Michael Vanier (Vanier, 2001; Bower and Beeman, 2007). A detailed description of the piriform cortex model and parameters can be found elsewhere (Vanier, 2001) (reviewed in [Souza and Antunes, 2007]). Briefly. the model is composed by conductance-based pyramidal and non-pyramidal cells disposed in a matrix of 16 × 6 positions (96 pyramidal cells) and 15 × 5 positions (75 non-pyramidal cells), respectively. The pyramidal cells are represented by 15 equivalent cylinders describing the electrotonic properties of the real pyramidal cells. Each interneuron is modeled as a single compartment. Ion channels were described using the Hodgkin-Huxley formalism and channel densities were adjusted to achieve the firing patterns observed experimentally (Vanier and Bower, 1999). The inputs from the olfactory bulb were simulated by 960 spike generators parameterized on real mitral cells (Bhalla and Bower, 1997). The connectivity of the network is based on the convergence and divergence patterns among the piriform cortex neurons. The pyramidal cells have excitatory recurrent connections with other pyramidal cells. Also, pyramidal cells have excitatory connections with feedback interneurons –FB cells- that send inhibitory projections to the pyramidal cells. Pyramidal cells receive inputs from mitral cells through the lateral olfactory tract (LOT). A sniffing cycle is simulated by theta bursts of weak synchronizing shocks in the LOT and odors are simulated by synchronizing transiently specific populations of firing mitral cells. The LOT conduction velocity of 7 mm/ms (Haberly, 1973; Ketchum and Haberly, 1993) was reduced by half and one third to simulate the effects of myelin disruption (Gutiérrez et al., 1995). LFPs were calculated using the currents flowing through each pyramidal cell compartment and the resistivity of the piriform tissue (Bower and Beeman, 2007; Wilson and Bower, 1992). The power spectral frequency of the network oscillations was calculated by the fast Fourier transform (FFT), and the peaks of the FFT power were taken within the theta (6 to 14 Hz) and beta bandwidths (15 to 30 Hz). Four tetrodes consisting of four polyimide-coated nichrome wires (diameter 12.5 um; Sandvik, Palm Coast, FL) gold plated to an impedence of 0.2–0.4 Mohms were connected to an EIB-16 interface board (Neuralynx, Bozeman, MT). Mice were briefly exposed to isoflurane (2.5%) prior to i.p. injection of ketamine-xylazine(100 ug/g and 20 ug/g, respectively). Anesthesia was verified by an absent toe pinch and tail pinch response. The fur on the head was cleaned using 100% ethanol and trimmed with scissors. The eyes were protected with ophthalmic ointment. The mouse was secured into a stereotaxic device with ear bars with the body aligned flat. The skin above the scalp was sliced down midline from the midpoints of the orbits to the midpoints of the ears to expose the skull. Two screw holes were drilled in the skull above the parietal cortex and one of the screws served as ground. Another hole was drilled above the frontal cortex within a diagonal band that overlies the piriform cortex: 1.6 mm anterior to bregma, 2.3 mm from the midline to 0.2 mm anterior to bregma, 3.4 mm from the midline. Neural activity was monitored visually as the tetrode was gradually lowered at depths ranging from 3.6 to 4.1 mm. The tetrode was secured to the bone using dental acrylic and allowed to dry. The recording setup is as described in (Li et al., 2015). The output of the electrodes/tetrodes was directed to a TDT (Alachua, FL) 1X gain headstage that was connected to an A-M Systems 3600 amplifier. The signal was amplified 1000 times before digitizing with a Data Translation Inc. (Marlboro, MA) DT3010 A/D card in a PC. Data were acquired at 24 kHz and low pass filtered at 3 kHz. Data acquisition was controlled with custom software written in MATLAB (MathWorks, Inc., Natick, MA, RRID:SCR_001622)(Restrepo, 2018). Time-frequency power decomposition of the LFP was obtained by means of MATLAB’s spectrogram.m function with a 1 s window and 90% overlap. To compare LFP power between genotypes, we utilized Mann-Whitney U-test with false discovery rate correction for multiple comparisons (Curran-Everett, 2000). The Journal of Neuroscience 37:10023–10034. Journal of Computational Neuroscience 4:221–256. Methods in Molecular Biology 401:103–125. Dialogues in Clinical Neuroscience 14:345–367. Journal of Neuroscience Methods 182:25–33. American Journal of Physiology-Regulatory, Integrative and Comparative Physiology 279:R1–R8. Multiple Sclerosis and Related Disorders 2:4–12. Neuroscience & Biobehavioral Reviews 28:497–505. Journal of Biomedical Optics 15:016027. European Journal of Neuroscience 40:3179–3188. New York, United States: Elsevier. European Journal of Pharmacology 463:3–33. Journal of Neuroscience Research 90:1693–1700. Reports on Progress in Physics 70:451–491. Journal of Clinical Investigation 121:4722–4734. Journal of Computational Neuroscience 7:149–171. Current Protocols in Neuroscience 8:Unit 8 24. Thank you for submitting your work entitled "Mild Myelin Disruption Elicits Early Alteration in Behavior and Proliferation in the Subventricular Zone" for consideration by eLife. Your article has been reviewed by two peer reviewers, and the evaluation has been overseen by a Reviewing Editor and a Senior Editor. The reviewers have opted to remain anonymous. Unfortunately, we regret to inform you that your manuscript will not be considered further. Specifically, while we agree that the model presents an interesting means to detect early deficits in myelination that may later lead to behavioral problems, the reviewers felt that more work would be needed to link the cellular changes and observations with the behavioral phenotypes. In addition, it was felt that more in depth analyses were needed to demonstrate that new oligodendrocytes are being generated. It is important to rule out cell death of precursors and provide more evidence that subventricular zone changes occur before axon damage or degeneration. We refer you to the full comments of the reviewers below for details. It is eLife's policy to only invite a manuscript for resubmission when the needed changes can be accomplished within two months time. Although that leaves us no choice but to reject your paper at this juncture, if you feel you can address the reviewers' comments with additional experiments and analyses, we would be pleased to see a new version of the manuscript and would make an effort to return the paper to the same reviewers. The study by Gould et al. investigates a very important problem, i.e. the cellular response in neurogenic and gliogenic regions of the brain to axonal injury. 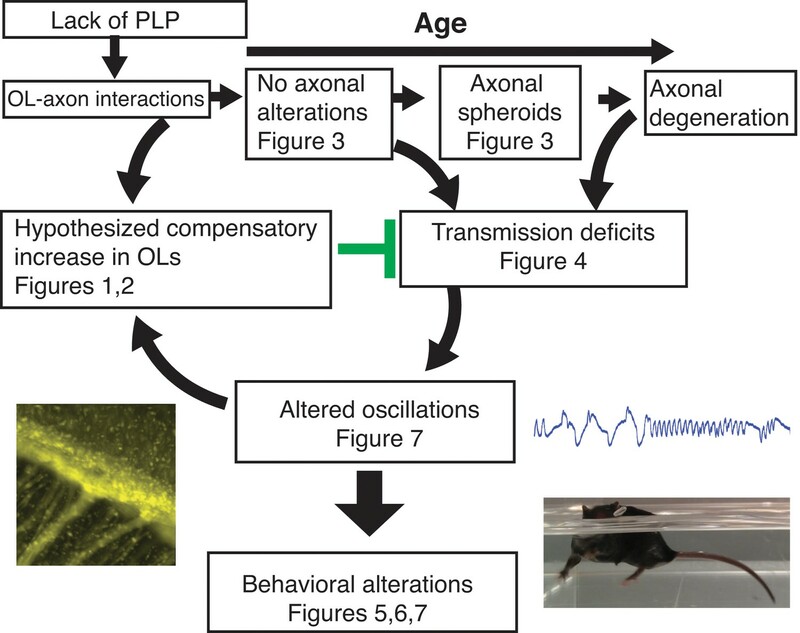 In particular, the authors investigate the Plp-null mouse, in which axon disruption occurs as early as 2 months in cortical projection neurons. High-volume cellular quantification showed region-specific increase in oligodendrocyte cell density in the olfactory bulb and rostral corpus callosum in adult age. Furthermore, analysis of the SVZ revealed a large increase in progenitor cells due to enhanced proliferation that preceded axonal injury. Finally, young adult Plp-null mice also displayed substantial behavioral alterations, which were associated with mild myelin disruption. Overall, this is a very interesting report, which highlights the importance of mild demyelination in white matter function. Furthermore, since mutations in the Plp gene or gene duplications lead to several dysmyelinating diseases, this report also has translational implications. There are two major aspects of the paper that will require revisions: 1) the cellular analysis of the SVZ in the Plp-null mouse and the link between changes in the SVZ and enhanced oligodendrocyte production, and 2) the link between cellular changes – both in axons and in oligodendrocytes – and behavioral abnormalities. • The authors claim that enhanced proliferation in the SVZ is generating new oligodendrocytes (OLs) in the OB and CC, but they haven't definitively proven this. They are relying on the specificity of the PLP-eGFP reporter for labeling only mature OLs. However, they previously published a paper showing expression of the PLP-eGFP reporter in ventricular-zone progenitors and migrating OPCs (Harlow et al., 2014). 1) Lineage tracing or viral tracing to label SVZ-derived progenitors and follow them to the OB and CC during these time windows. These SVZ-derived progenitors should be analyzed for expression of mature OLs (example: CC1). 2) Better confocal images showing lack of PLP-eGFP expression in SVZ progenitors (Figure 3—figure supplement 2). Need to indicate what region of the SVZ is being shown. The star annotation is doing nothing to help. Did they look at younger mice (P18) as well? 3) Co-stain for mature OL markers (CC1) in EdU labeling experiments. Are all the EdU+/PLP-eGFP+ cells in the CC and OB expressing CC1? 4) Co-stain the EdU+ cells in the SVZ for neuronal progenitor markers (i.e. Pax6) and glial makers (Olig2, NG2). Is there an increase in glial progenitors in the SVZ of PLP mutants? Or is there a non-specific increase in both neuronal and glial progenitors? • The authors claim that SVZ activation occurs before noticeable axonal disruption, but only looked at a couple regions (CC and striatum). What about looking at the optic nerve at P18? If SVZ activation is occurring before axonal damage, what signals are promoting the SVZ response? • The authors should discuss why there is a selective increase in OLs in the OB and the CC of the PLP-null mice. The authors also show enhanced reactive gliosis. This aspect and the potential role of reactive gliosis should also be discussed more extensively. • Figure 4. This figure shows no significant changes in oligodendrocyte cell death in Plp-null mice CC and OB, as demonstrated by TUNEL assay. This figure is not described or discussed in the Results section. Furthermore, it would be important to perform some capase-3 immunostaining as a further validation to specifically show no changes in apoptosis. • The cellular data should be better linked to the behavioral results. How do the increases in OLs in the OB and CC – and the axonal spheroids – potentially explain the behavioral phenotype? • Throughout the paper, many of the experiments are done at different time points (P18, 2 months, 3 months, 4 months, 6 months). There is little rationale of why these ages were analyzed for different experiments. It would be important to have a summary figure or cartoon that indicates what cellular and behavioral changes were found in the Plp-null mice at each age. That way the readers can make sense of the progression of the phenotype. Dysregulation of myelin, the insulating sheath around axons critical for normal axon function, contributes to many neurological disorders. Even mild disruption can build to major cognitive and motor deficits later in life. In this study, Gould et al. demonstrate that in a genetic mouse model of mild myelin disruption, mice lacking proteolipid protein (PLP) exhibit a distinct proliferative response in progenitor cells specifically within the subventricular zone (SVZ), and increased oligodendrocyte density in corpus callosum and olfactory bulb. These abnormalities occur prior to axonal disruption (commonly seen in PLP models) and results in later cognitive and motor behavior deficits. PLP is a major structural component of myelin, and in this study Gould et al. 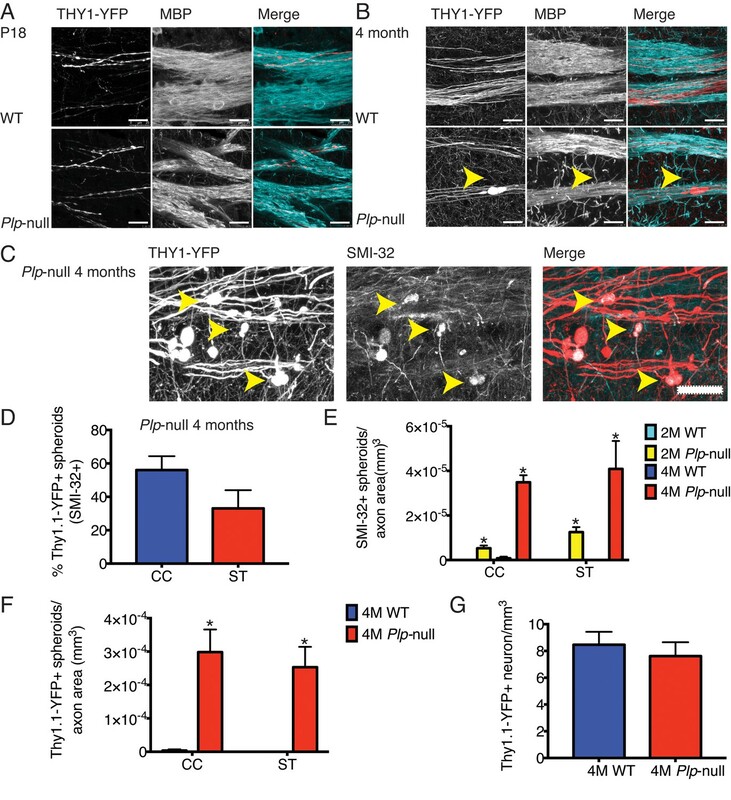 use a Plpnull mouse model to identify that well before late life myelin disruption, mice lacking PLP exhibit a significant increase in proliferation of precursor cells within the SVZ, and these cells preferentially become oligodendrocytes. The authors demonstrated clearly the very exciting phenomenon of SVZ-specific proliferation of progenitor cells histologically. The authors use an interesting technique for high volume cell counting and support this with cell tracking data using timed EdU injections. However the effect this has on behavior is less clear. While there appears to be some effect on complex motor tasks, the anxiety data is contradictory. 1) The flow of text and figures are not clear and linear, particularly within the behavior section. Please organize the figures within the text to make the data clearer and easier to follow. For example, Figure 7 is essentially backwards to how the data is presented, and some behavioral tasks are described in the text after the data from them is presented. 2) In the puzzle box test, the claim is made that higher complexity tasks were impaired in both the 3M and 9M groups, however in the 3M group, though one sees deficits at the filled stage, there is no longer a deficit at the covered stage, the most complex portion of this task. Can you explain this difference? Why do the WT animals appear to have also struggled at this portion of the task specifically in this timepoint? 3) How were animals divided for this study? Were the same animals run on all tests, and tested at 3M and again at 9M? Or is this different sets of animals at each timepoint? What is the order in which the tests were run? It would be helpful to clarify the order of events for these experiments as multiple testing in behavior can change an animal's response, which could contribute to the confusing anxiety behavior data. 4) It would be interesting to track the animal's behavior from before the SVZ proliferation, or even immediately after, through the late time points. At the behavioral timepoints measured, these mice are already exhibiting massive axonal disruption. Is this behavior due specifically to axonal disruption and long term myelin deficits? Do these animals exhibit any of these motor deficits earlier due to developmental loss of PLP? Can behavior be run at an earlier timepoint (maybe at P18, to match with the cell counting data) to verify the specificity of behavior to later myelin disruption, rather than an effect of the genetic background? 5) Why was EM not run to verify myelin disruption at the timepoints measured? 6) In the Discussion, please expand upon the role of SVZ-derived progenitor cells in this model and its contribution in disease models. What do you hypothesize these cells are responding to? Further, since you see an increase of astrogliosis, do you suspect this is due more to inflammation? […] Overall, this is a very interesting report, which highlights the importance of mild demyelination in white matter function. Furthermore, since mutations in the Plp gene or gene duplications lead to several dysmyelinating diseases, this report also has translational implications. There are two major aspects of the paper that will require revisions: 1) the cellular analysis of the SVZ in the Plp-null mouse and the link between changes in the SVZ and enhanced oligodendrocyte production. We present two new experiments to address this question. In the new Figure 2—figure supplement 3 we show that the newly produced oligodendrocytes differentiated into Gst-pi+EDU+ mature oligodendrocytes in the OB and CC (Figure 2—figure supplement 3). In addition, in the new Figure 2—figure supplement 7 we show that Pax6+ cells expressing Sox2, a marker of progenitors was reduced, indicating a reduction in neural progenitors in the RMS, consistent with a complementary increase in oligodendrocyte progenitors. Finally, we revised the figure showing that the density of EDU+ neurons (NeuN+) and the percentage of NeuN+ cells that were EDU+ 3 weeks after EDU injection, were not altered in 4M Plp-null mice (Figure 2—figure supplement 6). Thus, we have strengthened the characterization of the link from SVZ progenitors to mature oligodendrocytes. Future studies should use in utero electroporation or viral tracing to fully understand the changes in the SVZ lineage. However, in our opinion those experiments are beyond the scope of this manuscript. 2) The link between cellular changes – both in axons and in oligodendrocytes – and behavioral abnormalities. We present new data linking cellular changes to behavioral abnormalities. a) In Figure 4 we present measurements of the compound action potential (CAP) in CC showing a decrease in conduction velocity, and loss of the fast CAP peak at 2 and 6 months in the Plp-null. b) In Figure 7—figure supplement 1 we present results of computational modeling of oscillations in piriform cortex that indicates that a decrease in conduction velocity in the lateral olfactory tract would lead to an increase in field potential oscillatory power in piriform cortex, as we had found in Figure 7. We performed EDU labeling to quantify generation of newly generated mature oligodendrocytes identified with the mature marker Gst-pi+. We find that the newly produced oligodendrocytes differentiated into Gst-pi+ mature oligodendrocytes in the OB and CC (Figure 2—figure supplement 3). In addition, we showed that Pax6+ cells expressing Sox2, a marker of progenitors was reduced, indicating a reduction in neural progenitors in the RMS (Figure 2—figure supplement 7), consistent with a complementary increase in oligodendrocyte progenitors. We revised the figure (now Figure 2—figure supplement 4) to make it clear that there is a lack of PLP-eGFP expression in SVZ progenitors. We did not look at P18 mice. We co-stained EdU+ cells with the mature oligodendrocyte marker Gst-pi+. We find that the newly produced oligodendrocytes differentiated into Gst-pi+ mature oligodendrocytes in the OB and CC (Figure 2—figure supplement 3). In addition, we showed that Pax6+ cells expressing Sox2, a marker of progenitors was reduced, indicating a reduction in neural progenitors in the RMS (Figure 2—figure supplement 7). We co-stained EdU+ cells with Pax6. Pax6+ cells were significantly reduced in the main and accessory olfactory bulb, indicating a specific loss of Pax6+ neurons (Figure 2—figure supplement 7). In addition, the Pax6+ cells expressing Sox2, a marker of progenitors was reduced, indicating a reduction in neural progenitors in the RMS (Figure 2—figure supplement 7). Therefore, the increase in oligodendrocytes occurs at the expense of the production of Pax6+ neurons. Please note that we also have data for co-staining of EdU+ and Olig2 (Figure 2G). • The authors claim that SVZ activation occurs before noticeable axonal disruption, but only looked at a couple regions (CC and striatum). What about looking at the optic nerve at P18? We have included substantial new data in this revision of the manuscript. However, we had to limit the scope to a reasonable number of experiments, and we did not characterize axon disruption in the optic nerve. If SVZ activation is occurring before axonal damage, what signals are promoting the SVZ response? We do not know which signals are promoting the SVZ response. One of us (Macklin) was recently funded to study the involvement of mTOR signaling in oligodendrocyte differentiation. mTOR may be involved in the increase in Olig2 expression in SVZ. We added a brief discussion of reactive gliosis: Finally, we observed region-specific reactive gliosis in the white matter of the 2M old Plp-null mouse (Figure 1—figure supplement 4). Whether the reactive gliosis is caused by Plp depletion, or is a reaction to axonal disruption is not known. Interestingly, reactive gliosis is found in the CC of animals treated with cuprizone where it is thought to be mediated by Toll-like receptors (Esser et al., 2017). Figure 4—figure supplement 2 is now presented in the Results. While further studies with caspase-3 immunostaining are interesting, our opinion is that this experiment is beyond what is already a comprehensive study of cellular and behavioral changes in Plp-null mice. a) New Figure 4 shows the results of measurement of conduction velocity in the corpus callosum for Plp-null and WT mice at three different ages: 18 days, 2M and 6M. We find that the fast N1 conduction velocity peak in the compound action potential (CAP) in the corpus callosum is present in 18 day old mice, but is absent in 2M and 6M Plp-null mice. In addition, we find that the 18 day old mice do not display gait anomalies, in contrast with the older mice that display overstepping of the hind leg (Results subsection “Plp-null mice display subtle motor deficits”). These data provide a functional link between the changes in oligodendrocyte myelination/axonal disruption to problems in motor coordination. b) We modeled oscillatory activity in piriform cortex showing that a decrease in conduction velocity in the lateral olfactory tract is expected to cause an increase in oscillatory power in piriform cortex (new Figure 7—figure supplement 1). This observation provides a computational link between mild demyelination in the LOT and the increase in power we had observed in the previous version of the manuscript (Figure 7). Thank you for the suggestion. We have generated a summary Figure 8 for the discussion that shows when the cellular, functional and behavioral changes take place. Dysregulation of myelin, the insulating sheath around axons critical for normal axon function, contributes to many neurological disorders. Even mild disruption can build to major cognitive and motor deficits later in life. In this study, Gould et al. demonstrate that in a genetic mouse model of mild myelin disruption, mice lacking proteolipid protein (PLP) exhibit a distinct proliferative response in progenitor cells specifically within the subventricular zone (SVZ), and increased oligodendrocyte density in corpus callosum and olfactory bulb. These abnormalities occur prior to axonal disruption (commonly seen in PLP models) and results in later cognitive and motor behavior deficits. PLP is a major structural component of myelin, and in this study Gould et al. use a Plp-null mouse model to identify that well before late life myelin disruption, mice lacking PLP exhibit a significant increase in proliferation of precursor cells within the SVZ, and these cells preferentially become oligodendrocytes. The authors demonstrated clearly the very exciting phenomenon of SVZ-specific proliferation of progenitor cells histologically. The authors use an interesting technique for high volume cell counting and support this with cell tracking data using timed EdU injections. We are pleased that the reviewer finds exciting that we demonstrated clearly the phenomenon of an increase in SVZ-specific proliferation in Plp-null mice. In addition, the reviewer finds interesting the use of the cleared tissue digital scanned light-sheet microscopy (C-DSLM) for high volume cell counting supported by complementary data obtained using timed EdU injections. A manuscript describing the development of the CDSLM, that automatically corrects for changes in refraction index in partially cleared tissue allowing faithful light sheet imaging of Plp-eGFP is described in a recently published manuscript that is now referenced in the Materials and methods (Ryan et al., 2017). However the effect this has on behavior is less clear. While there appears to be some effect on complex motor tasks, the anxiety data is contradictory. We have rearranged the presentation of the behavioral data and we present new data to make it clear for which subset of behaviors there are clear differences between WT and Plp-null. The select behavioral effects are clear and are backed up by solid data. We respond to each specific point below. We agree. The flow of the text and figures was confusing, and this made it difficult to read the crucial section on behavior in the manuscript. We have thoroughly edited this section. The edits include a thematically-motivated split of Figure 7 into the new Figure 6 and Figure 6—figure supplements 1-5. We have also split the unwieldy table that was presented in Figure 2—figure supplement 6 into tables presented as supplements relevant to figures for each behavioral task. Furthermore, we present the behavioral analysis in a linear fashion starting with the motor task, that is closely related to changes in conduction velocity (CV) in the Plp-null and ending with olfactory function with the link to neural oscillations. The study of neural oscillations is now prefaced by a supplementary figure showing that circuit modeling of piriform cortex predicts an increase in oscillation power. Finally, part of the problem with linear cohesive presentation of the behavioral data was that we did not include a functional link from cellular changes to behavior. We now include a section on changes in axonal conduction velocity that provide a suitable bridge from cells to behavior (new Figure 4) followed by a preface to the behavioral characterization. The puzzle box test was designed with stages that involve on purpose different problem-solving tasks. Problem solving in each stage depends on learning at previous stages skills relevant to the present stage and problem solving and remembering previously learned skills in the present stage. The reviewer is correct that the 3M old group showed a deficit only in the filled stage. Why the 3M old did not have a subsequent deficit in the covered stage is not known, but it is likely due to skill learning in the previous stage. The wording has been modified to make it clear that the 3M old only had a deficit in the filled stage. Furthermore, it is not surprising that the WT mice struggle with transition to the last, most complex portion of the test. This is an interesting comment. Please note that a substantial fraction of these behavioral tasks is not suitable for younger animals. To answer this question, we chose to perform gait analysis in 18-day-old mice to gain information on changes in motor coordination. As stated in the Results (subsection “Plp-null mice display subtle motor deficits”), in contrast with the older mice, we do not find differences in gait between 18-day-old WT and Plp-null mice. In addition, we measured the conduction velocity of CC axons. We find that the fast conduction N1 peak in the compound action potential is lost in 2M and 6M Plp-null mice, but N1 is not absent in the 18 day old mice (New Figure 4). Thus, SVZ activation and an increase in the number of oligodendrocytes occurs before changes in axonal swelling and the motor coordination problem. EM was not run because there are published EM studies showing myelin disruption in Plp-null mice (references: Rosenbluth, Nave, Mierzwa, and Schiff 2006, Rosenbluth et al., 1996). 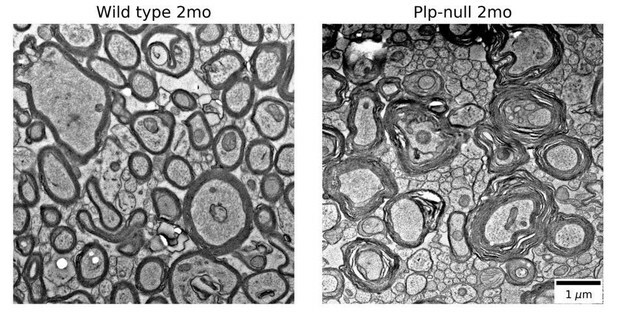 In Author response image 1 we show electron micrographs showing myelin disruption in 2mo old Plp-null mice. These images come from tissue that was first prepared for physiology, then post-fixed for EM. We are treating them as preliminary data because the animals did not undergo full EM fixation before imaging. Controls and proper EM fixations are necessary to fully replicate previous studies, though our preliminary images are similar to the published literature. Because there are published studies and a full EM replication would take a substantial amount of time, we would prefer not to show these preliminary EM micrographs. Rosenbluth, J., Nave, K. A., Mierzwa, A., and Schiff, R. (2006). Subtle myelin defects in PLP-null mice. Glia, 54(3), 172-182. Rosenbluth, J., Stoffel, W., and Schiff, R. (1996). Myelin structure in proteolipid protein (PLP)-null mouse spinal cord. Journal of Comparative Neurology, 371(2), 336-344. We modified the Discussion and we added a summary figure (Figure 8). We added a brief discussion of reactive gliosis: “Finally, we observed region-specific reactive gliosis in the white matter of the 2M old Plp-null mouse (Figure 1—figure supplement 4). Whether the reactive gliosis is caused by Plp depletion, or is a reaction to axonal disruption is not known. Interestingly, reactive gliosis is found in the CC of animals treated with cuprizone where it is thought to be mediated by Toll-like receptors (Esser et al., 2017).” Finally, at the end of the Discussion we speculate on translational application of compensatory changes in circuit oscillations and SVZ and we cite the recent review of Alameida and Lyons relevant to our findings. Funding was provided by a pilot grant from the National Multiple Sclerosis Society and NIH grants NS25304 (WBM), DC00566 and DC014253 (DR), AG053690 (DS), DC012280 and NS099042 (EG), NS048154, and IBM/FAPESP 2016/18825-4. We would like to thank Nicole Arevalo, Georgia Buscaglia, Katherine Given, Sean Hickey, Cayla Jewett for assistance. Animal experimentation: All animals used in this study were treated in accordance with the University of Colorado Animal Care and Use Committee guidelines. The University of Colorado Animal Care and Use Committee approved this study under protocol numbers 00270 and 00134. © 2018, Gould et al.